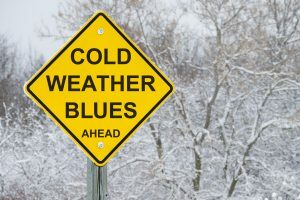 According to the Mayo Clinic, the exact cause of SAD is unknown but it is believed to be related to the reduced level of sunlight in the fall and winter and how it affects the body’s levels of serotonin and melatonin and its circadian rhythm. Less sunlight can cause the levels of serotonin, a chemical in the brain that affects mood, to drop which can trigger depression. The body’s production of melatonin, which helps regulate sleep patterns and mood, can become imbalanced. The circadian rhythm, your body’s biological clock, can also be disrupted by the decrease in sunlight. Increase Vitamin D3 – Vitamin D3 has been shown to play a role in mood and in the production of serotonin. It is naturally produced when your skin is exposed to sunlight. Since in the darker months the body receives less sun exposure, some people experience vitamin D deficiency. This deficiency, researchers believe, may contribute to SAD. If you are feeling chronically depressed in the fall and winter, increasing your uptake of vitamin D3 through supplements may help reduce your symptoms by providing you with the recommended daily intake. Try aromatherapy – Some essential oils have scents that can stimulate the areas of the brain that affect mood. Citrus, lavender, jasmine, and eucalyptus fragrances have been shown to help improve mood and provide some relief for depression, stress and anxiety. Exercise – Alleviating SAD symptoms is just one more reason to add exercise to your to-do list. Regular exercise gives a boost to your brain’s feel-good chemicals including serotonin. Exercise can also improve your sleep and can help you fight off weight gain. Eat healthy – People who are depressed often crave and overindulge in high-sugar foods because they provide a fast – albeit unhealthy – energy boost. These foods can cause your blood sugar to raise quickly and then drop, which can exacerbate your depression and lower your energy level. A better choice is to select complex carbohydrates like brown rice, whole grains such as oatmeal, dark leafy greens, and omega-3-rich foods like fish and nuts. These types of foods have been shown to promote increased production of serotonin. If you have tried to do the above and are still experiencing feelings of depression, speak with your doctor or a mental health professional. They may suggest other types of treatments, including medications that may help manage SAD symptoms and prevent them from coming back.